As IT organizations face increasing pressure to become more agile while also meeting the needs of end-users accustomed to public cloud services, the costs and reality of deploying private clouds can be challenging. OpenStack has emerged as the leading open cloud platform that not only enables large scale production-ready clouds but also drives down the Total Cost of Ownership (TCO) associated with on premises deployments. Supermicro and Mirantis are bringing the best of cloud and converged infrastructure together to simplify OpenStack deployments and reduce the time-to-value of your private cloud, allowing you to focus on your business and your applications. Together our goal is to ensure the success of your OpenStack cloud, enabling you to achieve Agile IT. The Supermicro Mirantis Unlocked Cloud Appliance supports various configurations depending on the desired capacity. Each Unlocked Appliance requires three foundation nodes, compute and storage nodes. Number of compute and storage nodes can be customized depending upon the workload requirements. 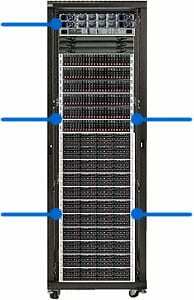 Once the master rack is at maximum capacity, a single expansion rack can be added.